When Anna Gordon follows her dream to New York City, she discovers something she never expected! Melody Carlson’s vivid imagery brings to life the sights and sounds of this light-hearted story. Anna is an engaging character, and I enjoyed her journey of self-discovery and her relationship with Sean O’Neil, a crush from her childhood. The conclusion of the story felt a bit rushed, but I did appreciate its ambiance and romance. 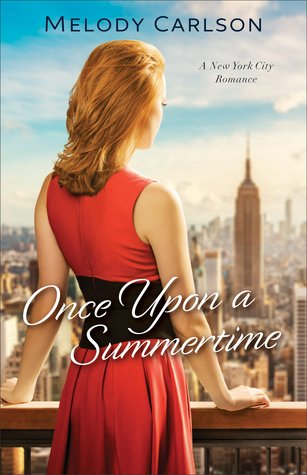 Once Upon a Summertime is an enjoyable story and a fun summer read! Managing the Value Lodge in her hometown was not what Anna Gordon had in mind when she set out in the hospitality industry. But it’s a safe choice for a woman whose childhood was anything but stable. Out of the blue, she gets a once-in-a-lifetime chance to reinvent herself by moving to New York City, where she hopes for a management position at a stylish new boutique hotel. The big city is full of surprises–not the least of which is Sean O’Neil. Her childhood crush has applied for the very same position!